For the third consecutive year, Syracuse’s dining centers have received an A+ rating from PETA (People for the Ethical Treatment of Animals), placing Syracuse University on the Dean’s List in PETA’s college rankings. According to VeganReportCard.com, “The Dean’s List includes an elite group of institutions that have accrued enough Vegan Report Card points to rank among the highest tier of A-rated schools They are the vanguard when it comes to vegan cuisine on campus.” Read more. Students at the University’s dining centers may have noticed a fresh, new item on the salad bars: baby radishes and beet greens. The produce is sourced from Agbotic Farms, a local farm an hour north of campus in Sackets Harbor, New York. Purchasing from Agbotic Farms allow the University the ability to offer students fresh, locally grown produce year-round – difficult to achieve in the Northeast. Read more here. Learn how Carrier Dome Concessions works with the Dome crew to organize all the Monster Jam merchandise for the event. Read article. 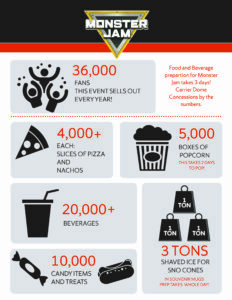 This shows the amount of concessions that Carrier Dome Concessions serves Monster Jam fans. Students with peanut and some tree-nut allergies can feel safer now, more than ever, while eating in Syracuse University’s dining centers. That’s because Food Services’ Production Kitchen and Cook Chill facility, located in the Commissary, recently became “certified free from” peanut and tree nut (except coconut) allergens by Kitchen with Confidence (KwC) by MenuTrinfo. KwC is a leading allergen and gluten-free auditing and accreditation firm; the Commissary is where most of the food served on campus is made. Read more here. We asked Food Services Sous Chef Adam Harvey to suggest a hearty, warm, tummy-filling dish anyone could prepare and everyone could enjoy over a chilly winter weekend. Not one to disappoint, Adam offered TWO recipes: a beef stew and, for those who prefer meatless dishes, Scandinavian Winter Vegetable Stew.